One of our most beloved Cat Blogosphere bloggers and one of the first, if not the first blogger we ever met was Mary Catherine Davis. She wrote the blog for Beau, the Gentlemen Cat. Miss Cathy has crossed over the people bridge. Our hearts are aching, the tears are pouring, and we are rethinking how we deal with people while they are here on this blessed Earth. Our deepest sympathies go out to Cathy's family and to all who knew and loved her. 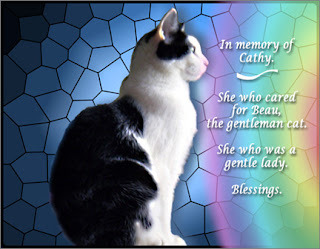 We'll never forget all the wonderful stories she wrote about Beau, the emails she wrote to jump in and tell us about something that was going on in the cat blogosphere or to help spread the word about someone who needed help. We'll never forget her and the first Catolympics event! We thought it was the most fun we'd had in a long time. She brought the cat blogosphere alive for us and helped to get us involved and heal our Mom's heart when she most needed it. A beautiful soul has passed over. We love you Miss Cathy and will miss you always. May we meet over the bridge again some day. As she always signed her emails "Blessings", and we say it to her as well. Blessings to you my friend. We love you. Thank you to Ann at Zoolatry for the beautiful graphic for Cathy and Beau. Mom Paula: Cathy always reached out to me and we communicated regularly through instant messaging on FB. She was very comforting during my surgeries and helped me through my grief when Sweet Praline was ill. I will miss those chats. We are so very sad about losing sweet Cathy. She was a dear friend to so many of us and she will be missed, as will Beau, who we also worry over, as we know Cathy would. Brenda you wrote a beautiful tribute and I know Cathy would be very touched. Oh, dear, you have us teary again. What a lovely tribute to Miss Cathy. We did know this sweet lady, but we is purring for her and her family and furriends. It was nice to see you today, my furriends! Come back for the turkey review! Such a lovely tribute to Cathy.